The Destoroyah Evolution Set, a web exclusive in Japan, was brought over by Bluefin Distribution as a regular release here in the USA. 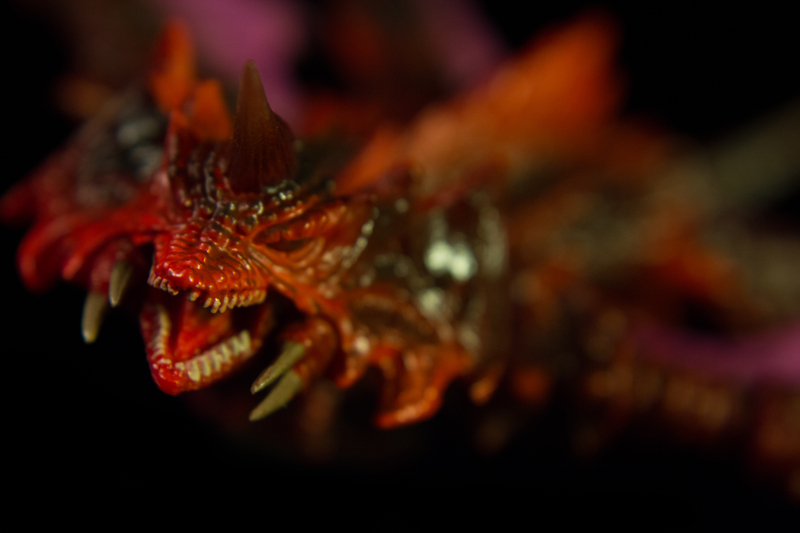 For the first time, S.H.MonsterArts released three figures in one package. Featuring three different evolution forms of Destoroyah (the Crustacean, Aggregate, and Flying forms), this set seeks to complete any collector’s needs. However, is it really worth the $89.99 price point? 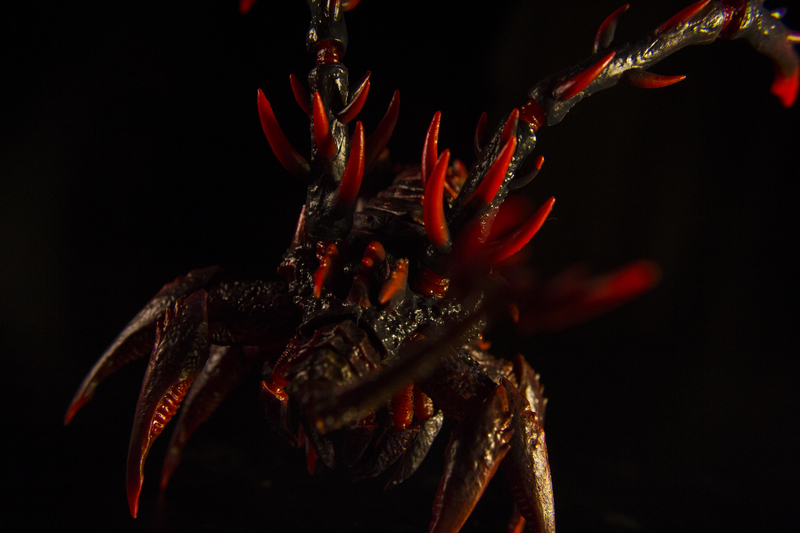 Standing at 1.5 inches, the Crustacean form is brilliantly sculpted by veteran monster sculptor Yuji Sakai. Being the smallest figure of the set, it's extremely detailed. The overall design captures what the outer shell of a crustacean would really look like, giving it a little boost of realism. The grooves and bumps in the sculpt really make it a neat little figure. Though these are excellent qualities, it does suffer some minor flaws due to mass production. 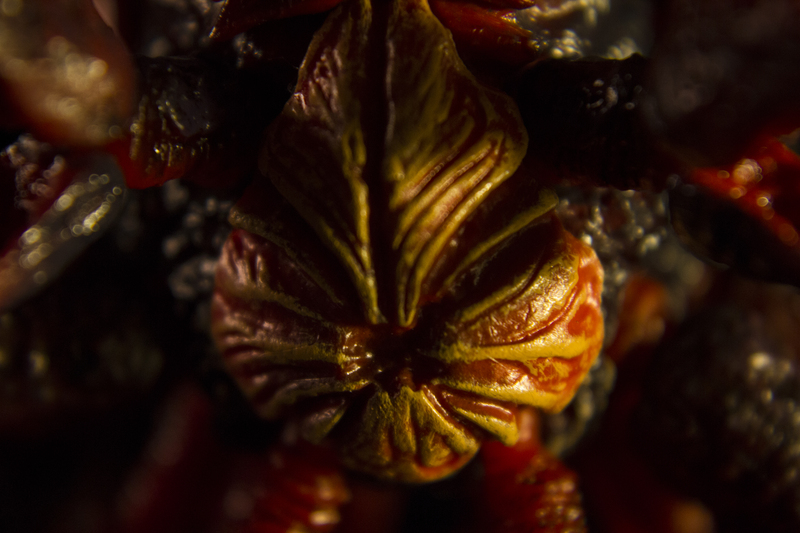 My main gripe concerns the mandibles. Unlike the Aggregate form, they're rather blunt and cartoony. Other than that, this is a fairly well done adaptation for a figure of this size. The Aggregate form is exceptionally sculpted by Shin'ichi Wakasa. Standing at 2.3 inches, the Aggregate looks just like its movie screen counterpart. 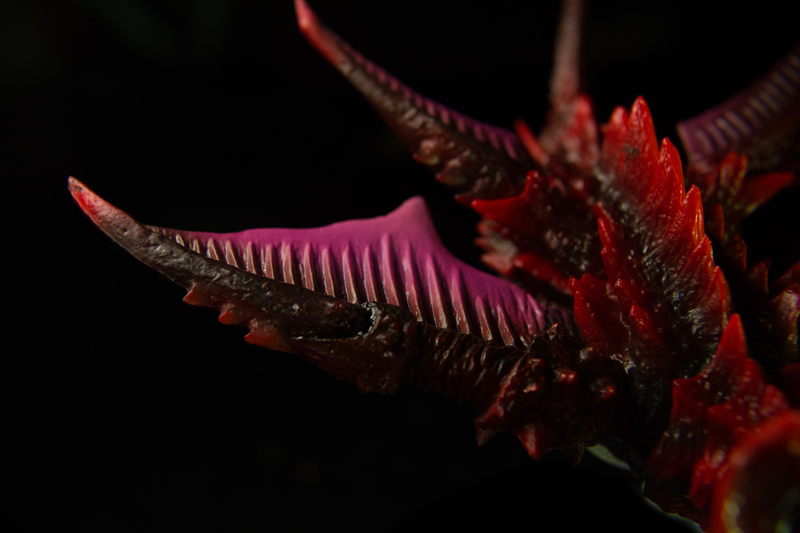 Applying similar concepts as those used in the Crustacean form, the figure retains that shell-like reflective armor. The legs, neck, and pinchers are what really shine. The immense amount of details used to give that armored look is just spectacular. 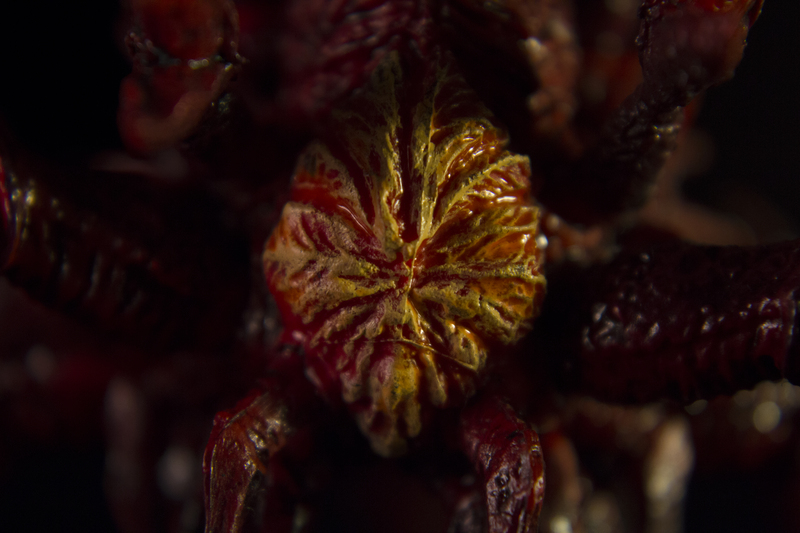 The mandibles on the Aggregate are spot-on unlike those of the Crustacean. I don't really have any gripes with this sculpt – it's fantastic. 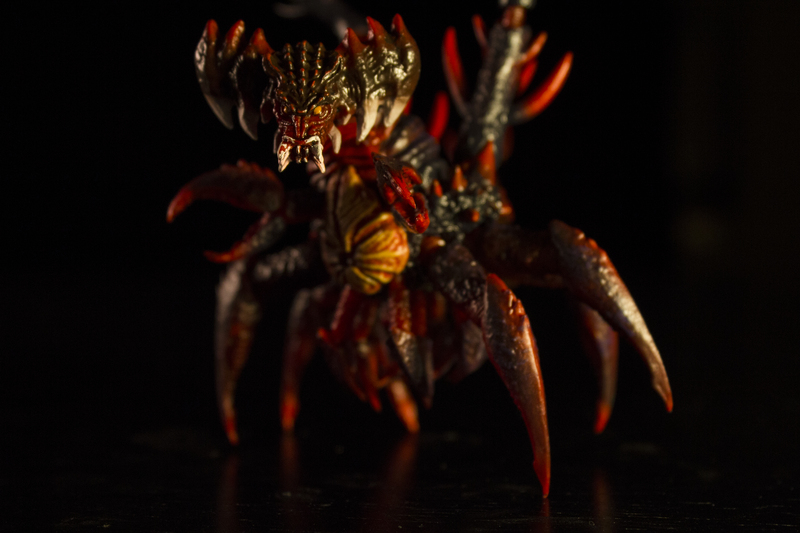 3.5 inches in length, the Flying form is definitely the showstopper of the set. 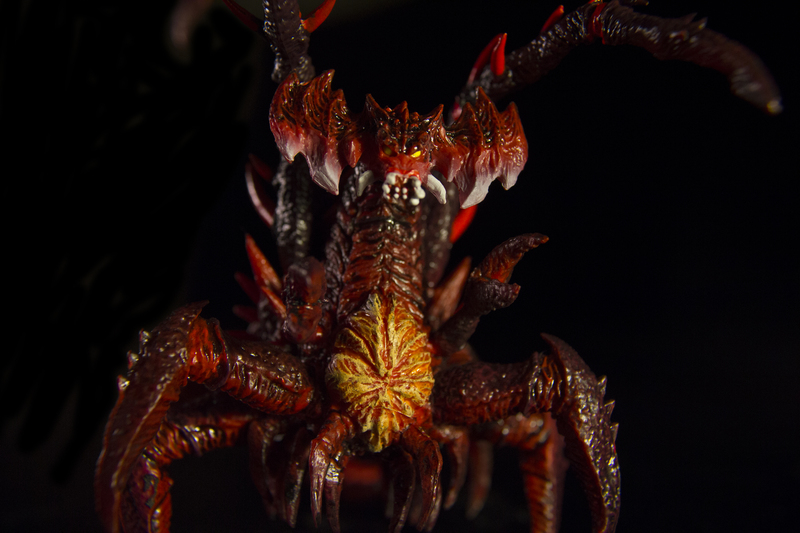 Sculpted by Shin'ichi Wakasa, this flying monstrosity looks perfect. The horn is translucent, letting light shine through it. Unfortunately the eyes, though made from the same material as the horn, do not illuminate next to bright lights. There was definitely a lot more focus put into this figure than the other two. Details in bumps and ridges are phenomenal. I can say that there are parts to this figure I didn't even know this form of Destoroyah had previous to this figure’s release. For example, under the belly it looks like there is a sack (or something of that variant) used to propel Destoroyah through the air. The head and wings look just how they did in the film as well. It really is a beautiful sculpt. 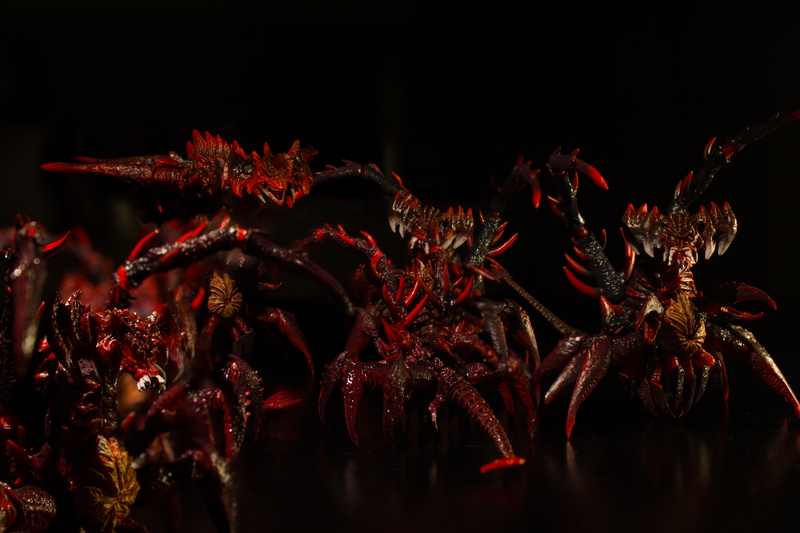 The Crustacean form has the least amount of articulation of the set. 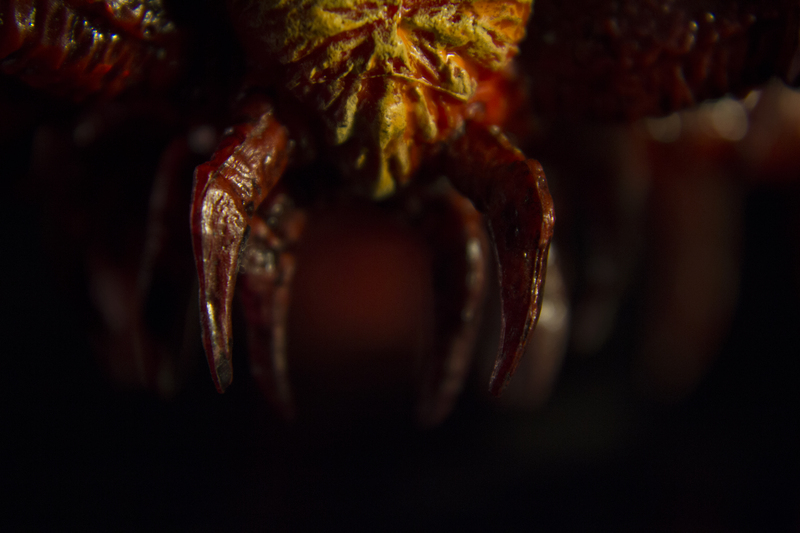 Its arms with pincers are able to move up and down smoothly, however the pincers themselves cannot open and close. Four of the six legs are stationary while the two legs in the middle are able to move in a full 360-degree motion if desired. Why only the two middle legs are articulated is beyond me. It would have been nice to see all the legs move. 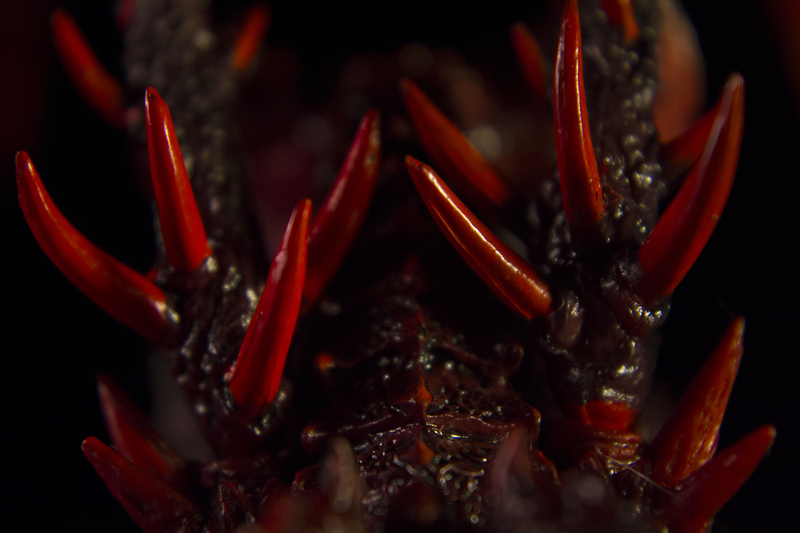 On the back side of the Crustacean there are two spikes that move left and right. They don't bring anything special to this figure. If feels like they may have been put there just to add a little more to the price point of the figure or to make the consumer feel like they're not just buying a statue. The tail just pops on (and you really have to jam it in there to get it in all the way), but has no articulation. The last point of articulation are the upper arms. The arms can be twisted left and right but that's about all. It's obvious that this figure was made to be in scale with Godzilla (1995) and it really is fantastic to pop it on the back of Godzilla to re-create the pre-meltdown scene. 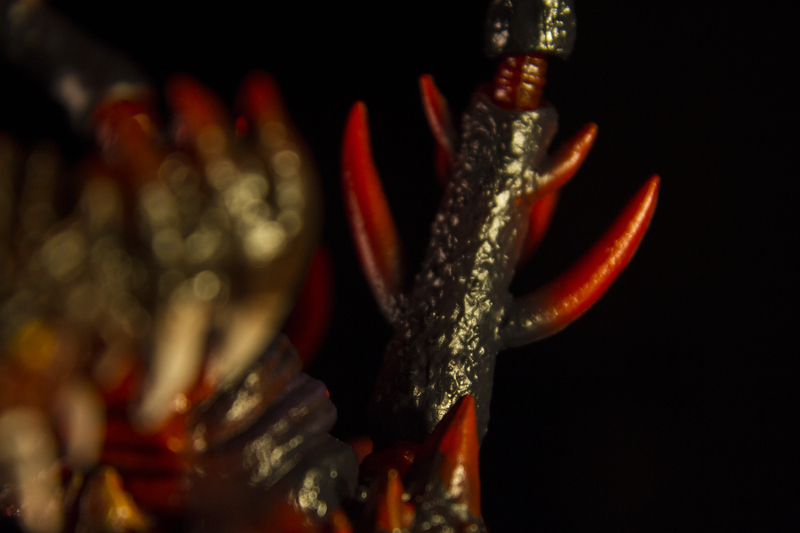 If you decided to pick up multiple Destoroyah Evolution Sets, you could have your own little army of Crustaceans attacking Godzilla! That being said, given the figure’s size, I would have liked to see the rest of the legs articulated as well as the head, neck, and tail. The Aggregate form's articulation is about what one would expect, with every major body part able to move. 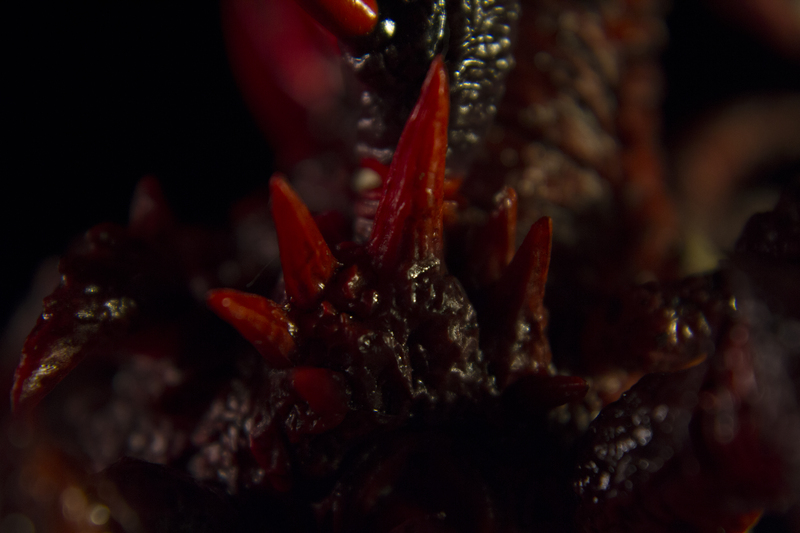 Unlike the Crustacean’s legs, the Aggregate’s legs are all able to move and are connected using a ball joint system, allowing the legs to move in a limited 360-degree rotation in addition to their ability to extend or contract. They're initially a bit stiff, but it just takes some moving around to loosen them up. The tail requires some minor assembly upon opening the box. It pops into the ball joint quite easily. The tail is articulated, but not as much as one might have wished. It's way easier to assemble than the Crustacean’s tail. After a few joints of articulation, the tail is mostly straight, sort of like the last section of Godzilla (1994)'s tail. However, it does get pretty small toward the tip and it would have been nice to see a fully articulated tail. 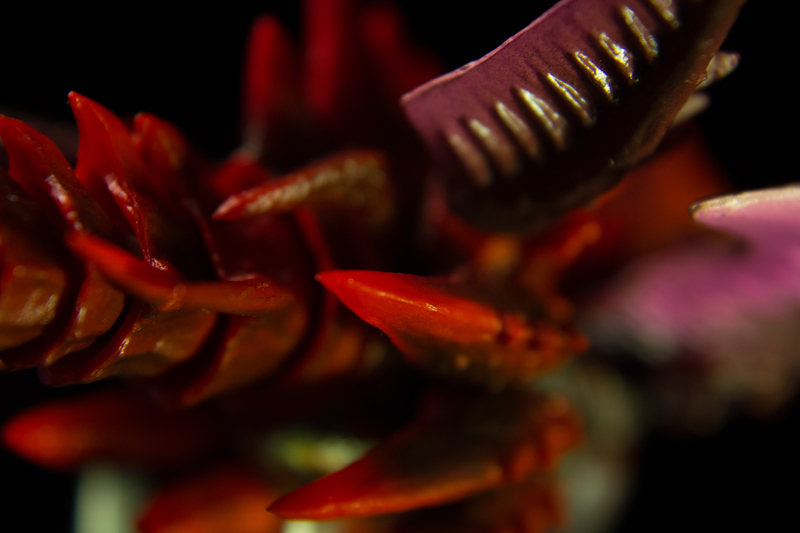 Like the Crustacean, the Aggregate’s mandibles do not move. The neck and head have the best articulation and it's easy to replicate the Aggregate’s creepy movements. Hidden inside the head is a double jaw. You can retract this by popping off the head and using the ball joint attached to the neck to push the inner jaw out (this is located behind the head piece). 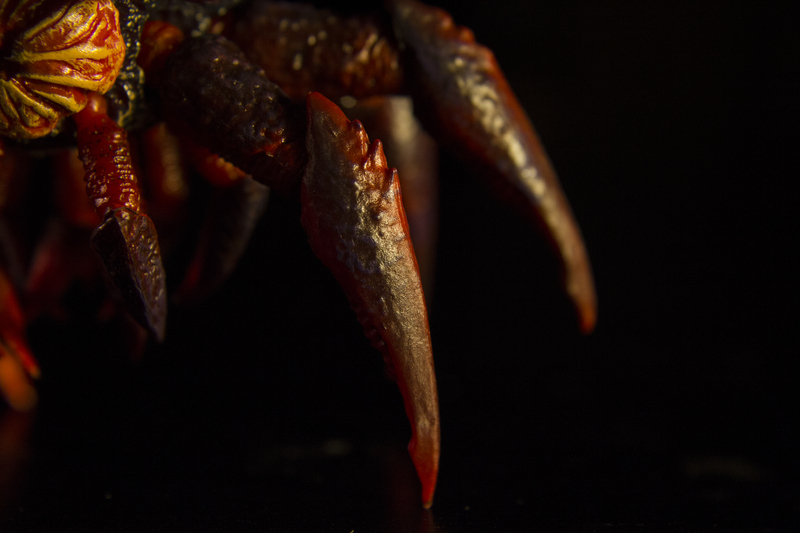 Under the belly are small claws that are articulated as well, though I'm not sure why, as the slightest tap in the wrong direction results in the claw piece falling off. 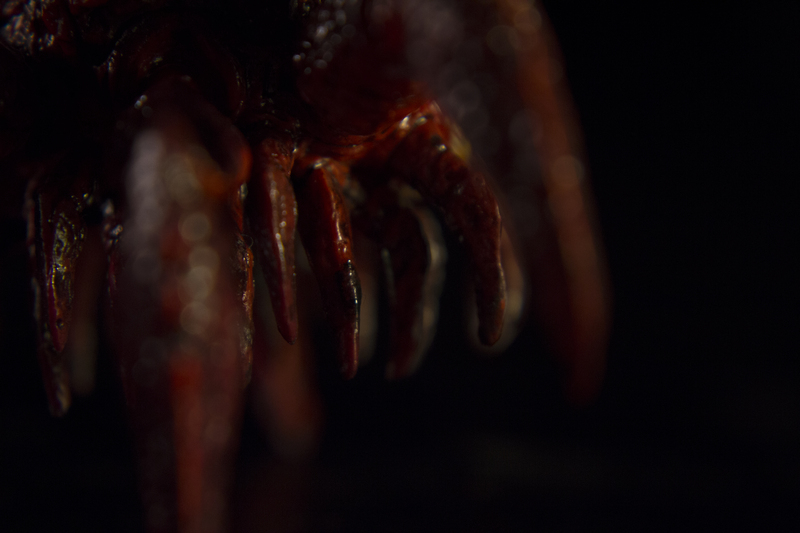 The arms with the pincers are able to move up and down (not as much as the Crustacean’s) and the pincers are able to open and shut. The arms are just as stiff as the legs, so one may want to remove the pincers to loosen up those arms for the first time. 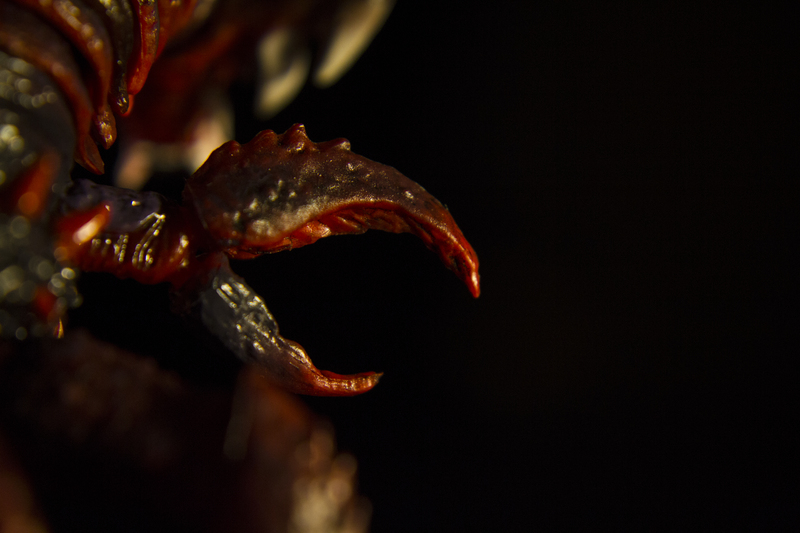 Last, we have the upper arms, which feature better articulation than found in the Crustacean form since they're connected with ball joints. The arms are able to twist in a 360-degree manner as well as move back and forth and up and down. The articulation isn't perfect by any means and it's nice to know that the sculpt wasn't sacrificed for it. My only real gripe is that I wish the many little claws under the belly didn't fall off so easily. The Flying form’s articulation is a bit more limited – not as much as the Crustacean’s, but it is just about what can be expected from this figure. The wings are able to flap/rotate with a 360-degree motion. The mouth can open and shut. 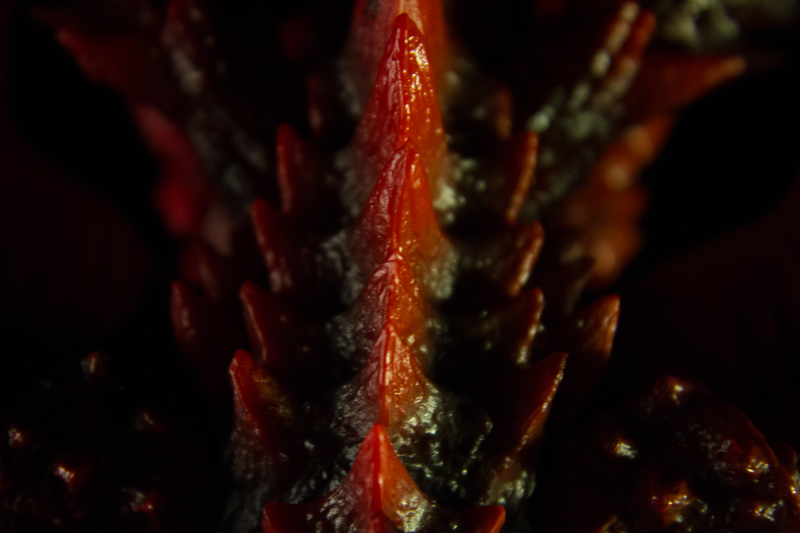 The tail is able to move up and down and side to side and features more articulation than found in the Aggregate. The legs are able to move left and right, however not by much. Lastly, the head and neck are next to perfect. Able to move up and down and left to right, the motion created couldn't be more screen accurate. Gripes? The tail is droopy when lowered a little under the body and can't hold its pose. The legs are so limited in motion that too much force makes them fall off. The neck has great articulation looking up, but is limited when looking down. 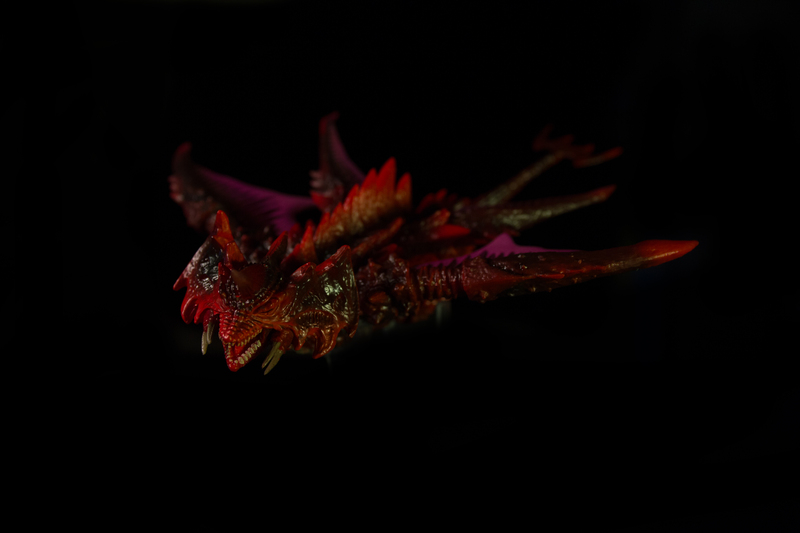 It would have been nice to let the figure actually look down like Fire Rodan. Nevertheless, this is still the most solid articulation found in the set. The Crustacean form's paint job is excellent. The shades of red, purple, and orange make the perfect blend of dark colors. I really do like the overall paint job, especially for its size. 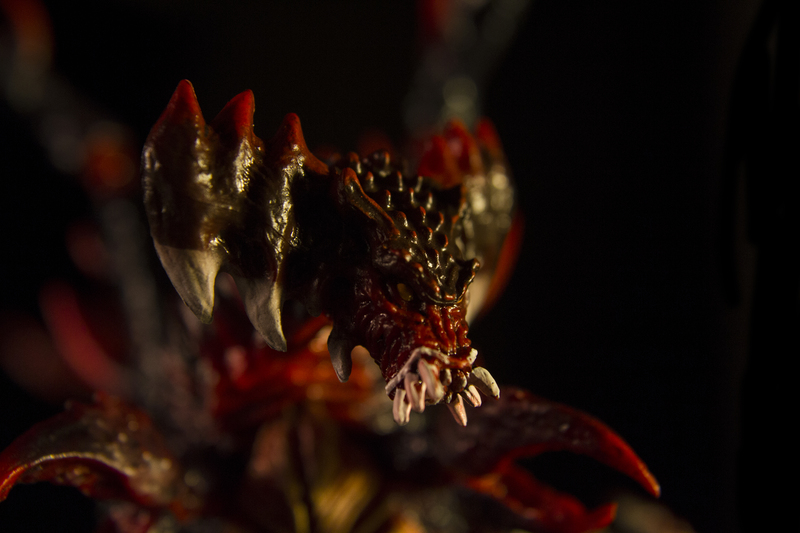 However, the mandibles have no blending like the promotional shots did. It's just solid white. Otherwise, this is an excellent paint job. The Aggregate form's paint job is absolutely brilliant! 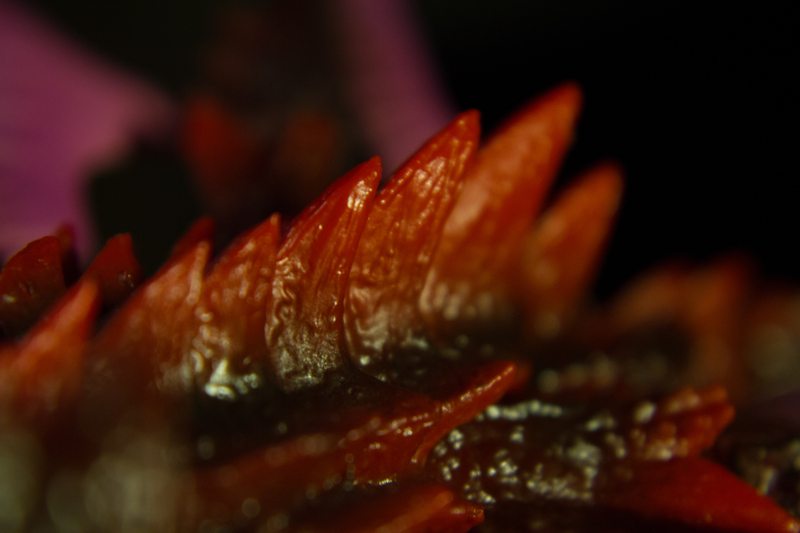 It uses a similar color palette to that used in the Crustacean form, but is better. Since the figure is bigger, the paint only accentuates detail. A good example are the legs and neck: perfect blending techniques matched with a great sculpt. Under the belly, the paint is quite different from the rest of the body, as it features a grayish-blue, black, and white chest piece. I'm indifferent about this last point since I don't actually see it unless I flip it over. The mandibles, like those of the Crustacean form, are not blended properly and are pure white. The prototypes and even the box have properly blended mandibles, so I'm miffed that the final product does not. Overall though, it features an excellent paint job. The Flying form's paint is the best of the three figures. It uses most of the same colors while adding purple and yellow into the mix. To make the wings pop from the rest of the design, they're given a purplish-pink color which compliments the rest of the figure’s red and black colors. Near its legs there is a multi-colored sack featuring yellows, blues, purples, and oranges, which actually makes it look quite toxic (which would make sense as it carries the solution that propels the Flying form into the air). The tusks near the mouth are perfectly blended, unlike the mandibles on the Aggregate or the Crustacean. Was this possibly a fault of mass production? The only gripe I have is that the eyes aren't represented correctly as they are red and not yellow like the rest of the figures in this set. Perhaps they were continuing Destoroyah's (final form) red eye trend? Other than that, this figure’s paint job is the most solid of the set. 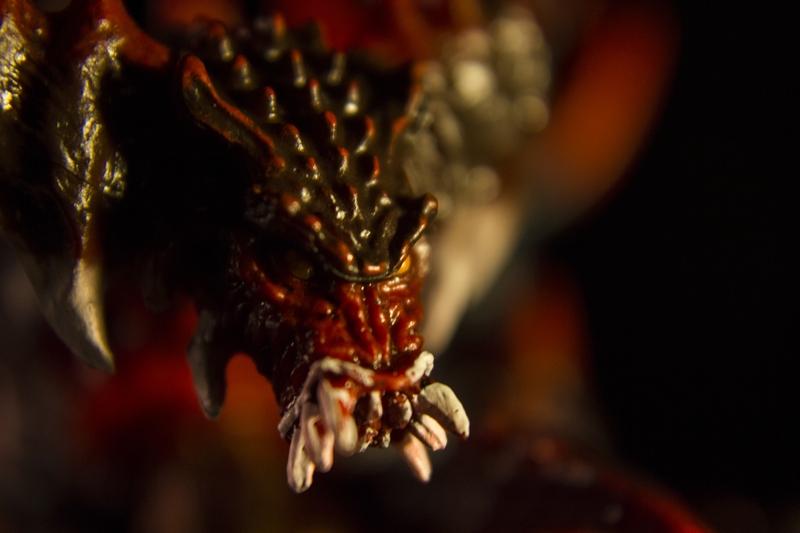 This set comes with only one accessory: a swappable Aggregate head with a LONG double jaw. As this never happened in the film, it is hilarious how exaggerated it really is. I'm even tempted to actually modify it myself to at least half its size. We have to realize Toho approved this design, so maybe there's something about the Aggregate’s anatomy we don't know about. Either way, I can see most fans leaving this attachment in a plastic baggy or in the box as it's just not very appealing. It would have been nice to get some beams since Destoroyah (final form) didn't come with any accessories at all. A stand for the flying form would have been ideal as well. There are a few options out there to remedy this though. 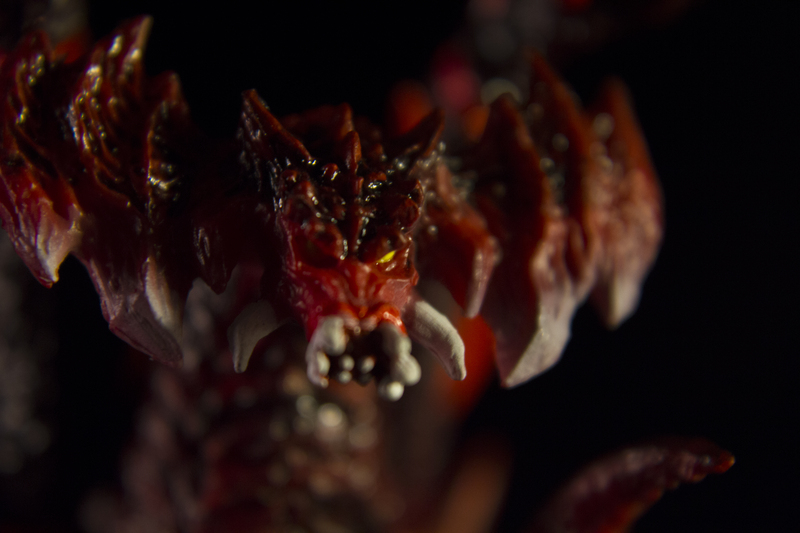 You can always use Fire Rodan's stand, buy a 2.5 inch FlightPose stand, have the Aggregate hold it up with its big arms, or pose it on the ground of whatever surface your monsters are currently residing. Disappointing. The Destoroyah Evolution Set is pretty neat and has some cool qualities to offer, but also has some small drawbacks and a high price point, which may discourage some collectors. When the set was announced, I didn't jump up and down in excitement, but I was intrigued as I've never owned any of these forms before. It makes sense that the set was a web exclusive as I feel its appeal has a limited following. That being said, with this line, it seems that all web exclusives tend to delve into the steeper price points. I don't think this set is worth the $89.99 price tag and I'd like to recommend waiting for its price to decrease (however, I don't foresee this set being sold lower than $70 anytime soon). It does make a great addition to Destoroyah and gives a sense of completion. 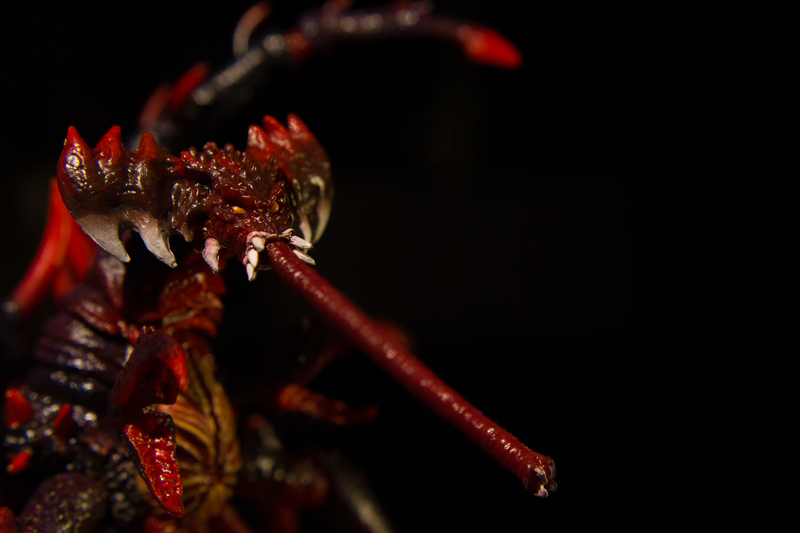 The thought of having a small army of Crustaceans and Aggregates is rather chilling yet awesome. Is it a must have? To most, no. Do I recommend the set? If you don't mind the cost, yes.